Inch Worm technology gently releases air, inch by inch, as the valve advances into backwash. 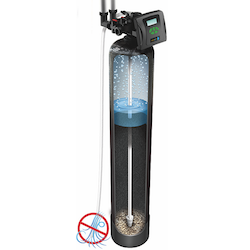 Filtration using a column of air oxidizes sulfur, iron and manganese to form precipitates that easily can be filtered and removed by a chemical-free solution. A filter capable of utilizing this air release technology can effectively reduce sulfur, iron or manganese with worry-free regenerations.